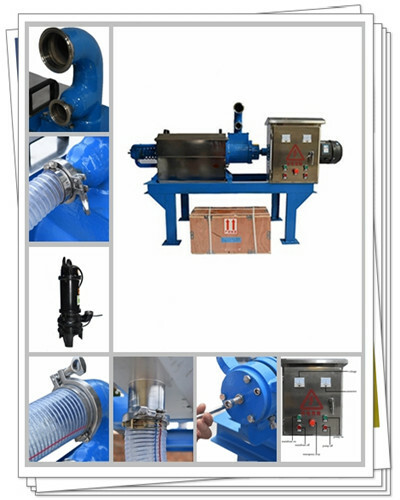 Manure separator is mainly used on farms，we provide the perfect solution for manure management. Standardized farming brings a lot of pollution to the environment, manure slurry is not easy to flow and is not easy to transport, this problem has plagued many farmers. 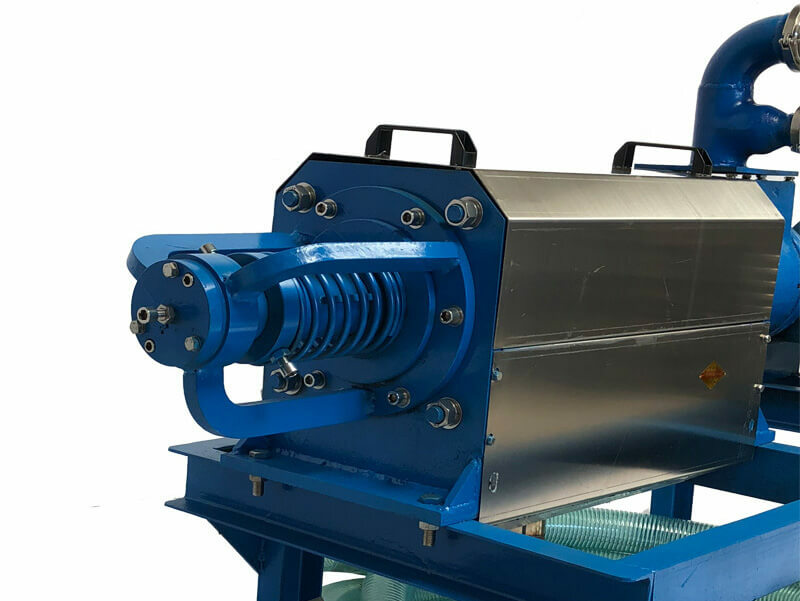 After years of research on manure processing technologies, our company's R&D team has worked with local agricultural universities to develop an advanced manure separator screw press. Let me introduce our products below. *The above data is for reference only. There will be different data depending on the moisture of the material. *If you need more detailed technical parameters, please leave a message. 1. Handling chicken manure is very difficult. Chicken manure has always been a problem compared to other kinds of farm manure. Chicken manure(especially broiler) is more viscous than other farm manure, after years of technology upgrading, our equipment has solved the problem of handling broiler droppings. This is rarely the case with our products because we will design the equipment according to the customer's condition. This involves our core technology, if you have any questions about this, please leave us a message on the website. There will be technicians to solve your problems and make professional suggestions. In general, selection of double screw conveyor for handling chicken manure. 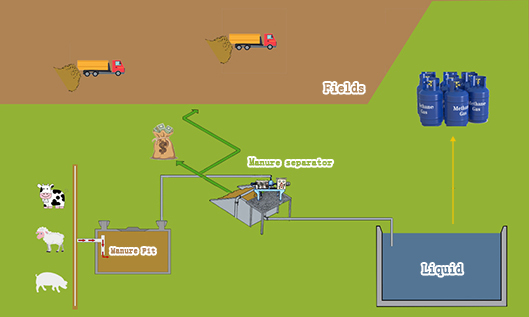 ☞ The pump delivers the manure slurry to the manure separator. ☞ Under the action of power, manure slurry enters the sieve body. 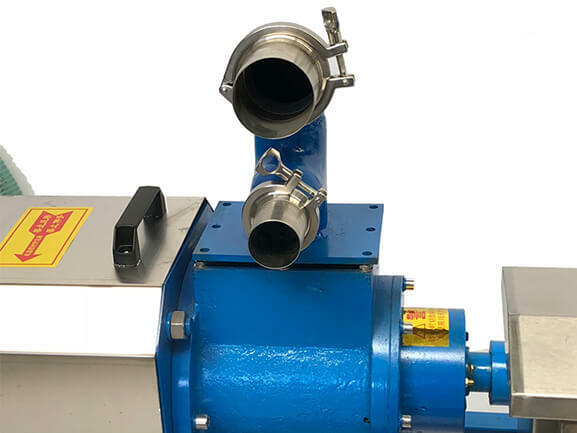 ☞ Through the thrust extrusion of the screw conveyor, After screen filtration and dehydration, solid manure is discharged from the discharge port. ☞ The liquid is discharged from the liquid outlet through the screen. This is just a simple process. If you need more details, please leave us a message. This product has been successfully developed over the years. In the past few years, it has received the very high evaluation in the market. 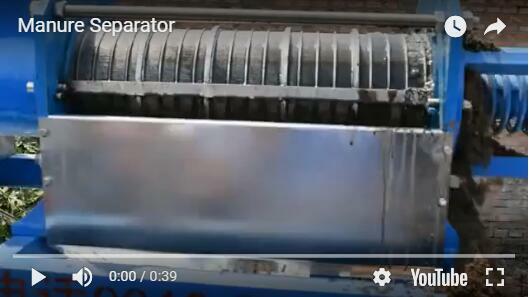 We are a manufacturer of metal filtration and separation products. Compared with other manufacturers, all parts can be manufactured by ourselves. 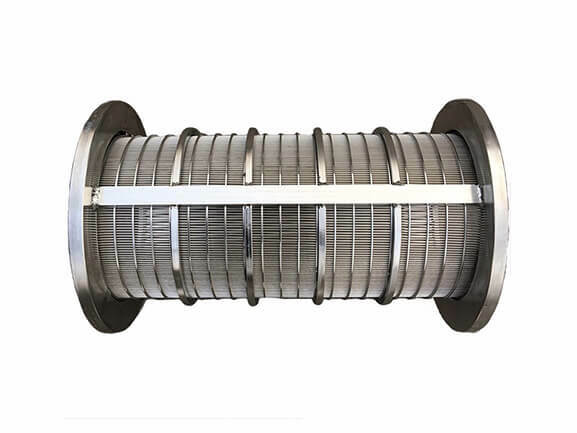 Especially the drum screen , we are the largest manufacturer of wedge wire screen in northern China, for the manufacture of drum screen has a wealth of experience. After years of technological innovation, our products have withstood the test of the market. Currently, due to the advantages of quality, it is very popular in the European and American markets. We have a strict quality inspection system, guarantee that you receive high-quality products. We have a modern production line, all our accessories are produced independently, so our price is very cost-effective in similar products. At the beginning of the design we considered the optimization of the installation problem, we only keep the most practical design, making installation easier. We have instructions for installation, installing video and other materials. For installation problems, you can also contact our website, there will be technical staff to help you. 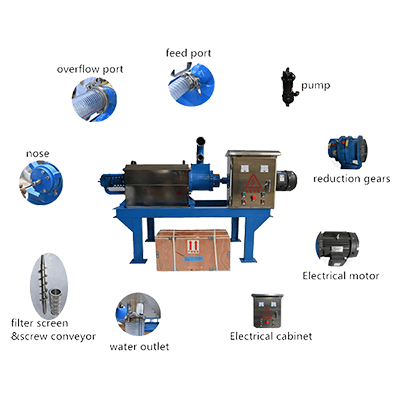 Provide complete parameter data based on your actual design requirements, and there are technicians to provide the perfect matching solution. a. Quality problems, the first time to deal with it. b. Technical questions, online consultation. c. Installation of technical guidance. d. Cleaning and maintenance technical guidance. e. Problems or failures in the use of products, provide the solutions. If you need other services, please leave us a message. 1 We can see that there are two mouths in the upper feeding part. The upper interface is the overflow port, the lower interface is feed port. 2 Connect the feed steel wire tube to the host feed port, quick coupling connection. 3 Connect the other end of the feed wire tube to the submerged pump. 4 Using the other steel wire to connect the host upper overflow backwater with a fast card. the other end of the steel wire fixes in the feedstock.So that the overflow of material can reflow the material pool. 5 Quick coupling connected to the drain under the host. 6 The head of the host machine is an adjustable top extrusion spring. By adjusting the fit of screw and spring. it can achieve the best dehydration effect. PS：When the top wire of the spring regulator is in place, the screw on the top spring will be locked, then the top wire turns back. 7 The top of the control cabinet is Ammeter and voltmeter. The following buttons are mainframe on, pump on, mainframe off and pump off. There is an emergency stop button between them which can be quickly powered off in emergencies. NOTE: PLEASE TURN ON THE POWER OF THE HOST BEFORE STARTING THE MACHINE, THEN TURN ON THE POWER OF THE SEWAGE PUMP. TO PREVENT ACCIDENTAL DAMAGE TO THE HOST, TURN OFF THE POWER OF THE SEWAGE PUMP BEFORE SHUTTING DOWN THE MACHINE. ☞ Choose a place with a flat terrain. ☞ Convenient for transporting manure slurry. ☞ It is better to build a platform, convenient material storage. Length:3 M , Width: 2 M , Height: 1.5 M .
☞ The discharge pipe avoids bending into a right angle. ☞ If installed outdoors, build a simple shelter. 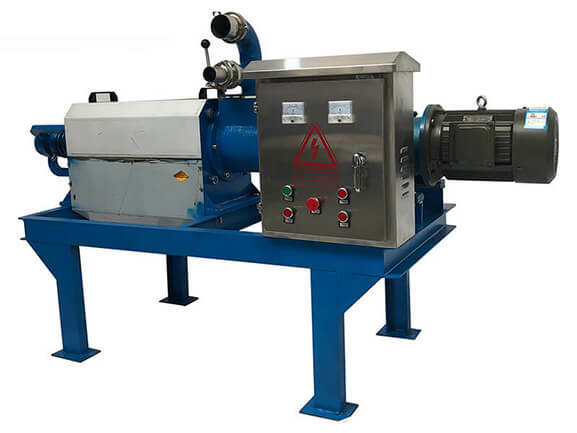 The Manure separator needs to be cleaned once after one week of use(Chicken manure is best cleaned more frequently), guarantee the efficiency of the filter screen(wedge wire screen) and low water content of extruded solids. 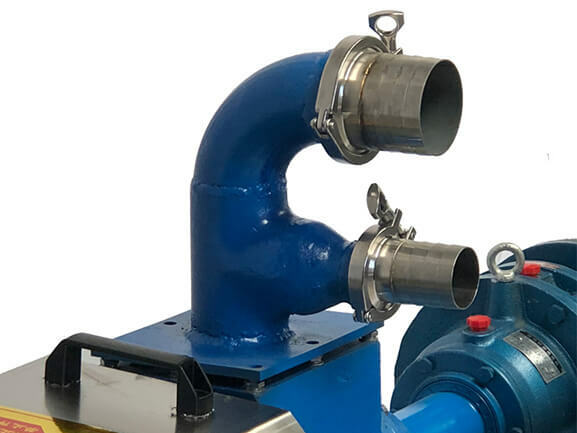 If it is found in the working operation that the discharge liquid of the liquid outlet is reduced or the water content of the discharged solid is high, can be done separately for nine stops and power on operations. ☞ Turn off the pump, the host will work for another 2-3 minutes. ☞ Open the protective cover, wash with a high-pressure spray gun or a brush. ☞ After cleaning, cover with protective cover. 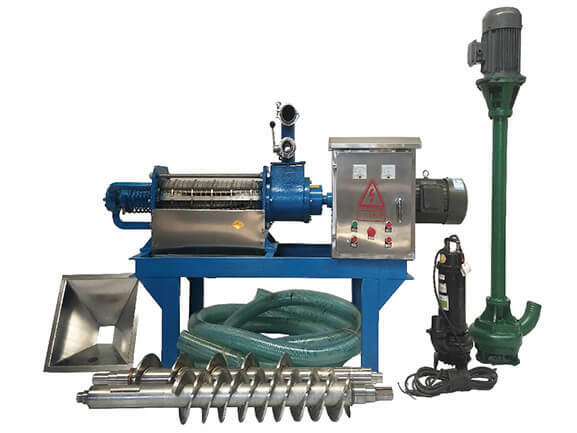 For more detailed cleaning steps of manure separator(manure dewatering machine), please contact us, we will provide a cleaning step video. Please let us know the model you need, if you need customization, please let us know your needs. The price of our product is very competitive.